My brother's roselle plant full of fruits. My younger brother Ahmad Ali just loves eating roselle calyces. We all love roselle but Ahmad Ali loves them a lot more than all of us do. My dad’s cousin (Uncle Najib) has a few roselle plants in front of his house and everytime we visited him, my brother would pluck one and eat. He kept the pods and plant them when he reached home. He now has 3 healthy roselle plants full of fruits. My brother wrote about roselle and I have to admit that he did a pretty good job. With a sudden interest in roselle, I decided to do some research on the internet and I found that roselle (scientific name: Hibiscus Sabdariffa) is popular all over the world and is very healthy too! Many parts of the roselle plant can be eaten but the red calyces (the red fleshy part of the fruit) are the most popular. They can be used fresh to make juice, jam, jelly, syrup, gelatin, pudding, cakes, ice cream and flavouring. They can also be dried and brewed into tea, spice and used for butter, pies, sauces, tarts and other desserts. It also processes pectin that makes a firm jelly. It contains antioxidants including flavonoids, gossypetine, hibiscetine and sabdaretine. They are also rich in riboflavin, ascorbic acid, niacin carotene, calcium and iron. 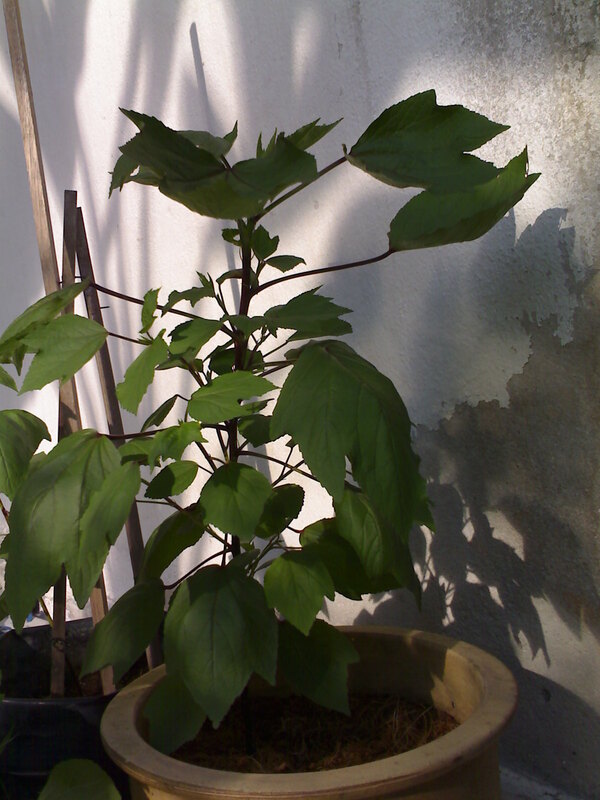 The young leaves and stem could be eaten raw in salad or cooked. Sometimes they are added to curries as seasoning. It is said to have an acid, rhubarb-like flavour. The seeds can be roasted and ground and used in soups and sauces. The roasted seed could also substitute coffee beans. The young root is edible but very fibrous. 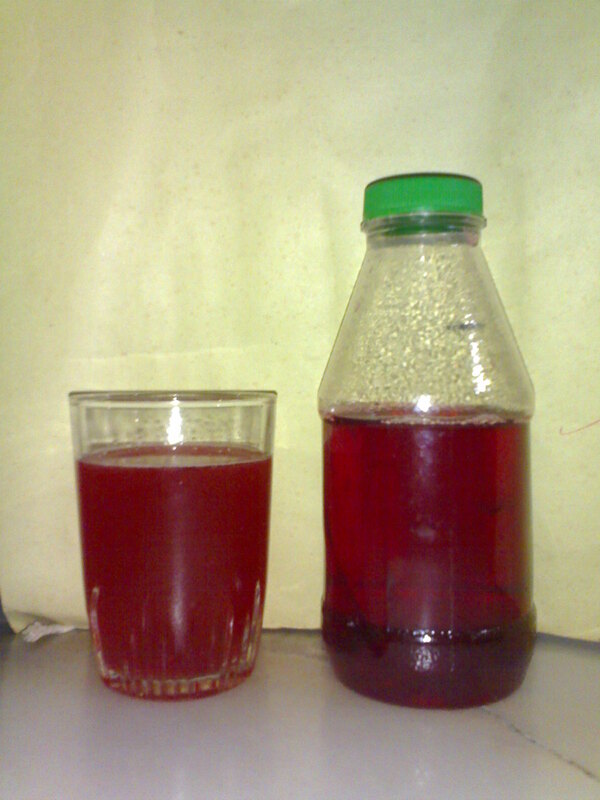 My mother's homemade roselle juice. 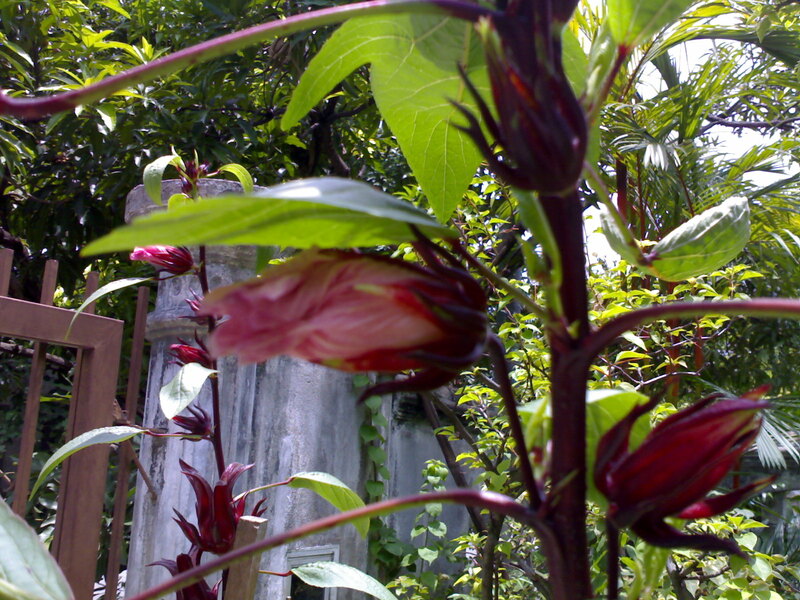 Roselles are also used in medicine since a long time ago. They contain ascorbic acid and glycolic acid which are able to increase urination. The juice from boiled, ripe roselles (sometimes with salt, pepper, asafetida and molasses added) is taken as a remedy to treat billous attack. Also used as a cooling herb providing relief during hot weather. The citric acid helps to increase the flow of blood to the skin’s surface and dilating the pores to cool the skin. In East Africa, the calyces infusion is used to relieve coughs (known as ‘Sudan Tea’). 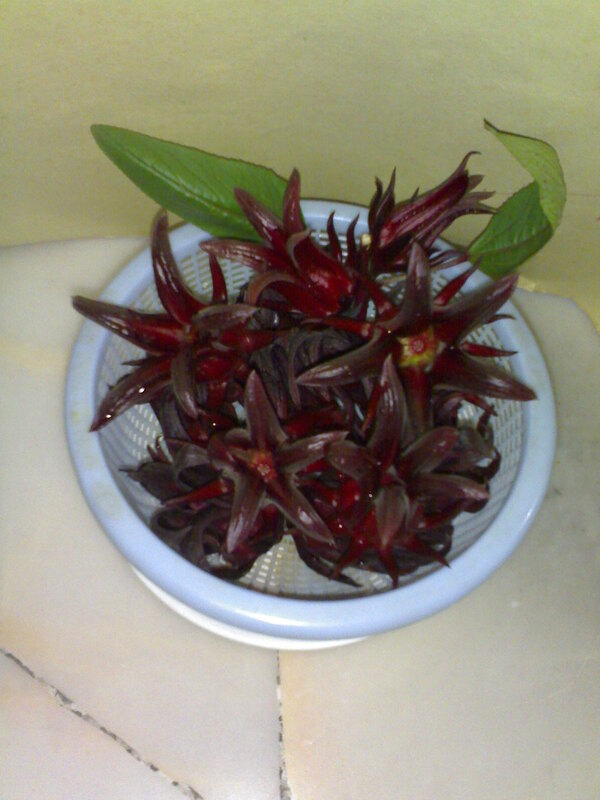 Roselle tea is believed to be able to reduce cholesterol too. Freshly plucked roselle from Ali's plant. Ali's roselle plant a few months ago - too young to bear fruits. We have succeeded to persuade mum to make us roselle juice and they are really tasty. Ali commented that it tastes something like the ‘Ribena’ blackcurrent drink. I hope mum will make us roselle jam next. How to make roselle juice? Click here for the recipe (pictures included). Roselle from a kid’s point of view. Click here. ‘Roselle picking’. Click here to read. 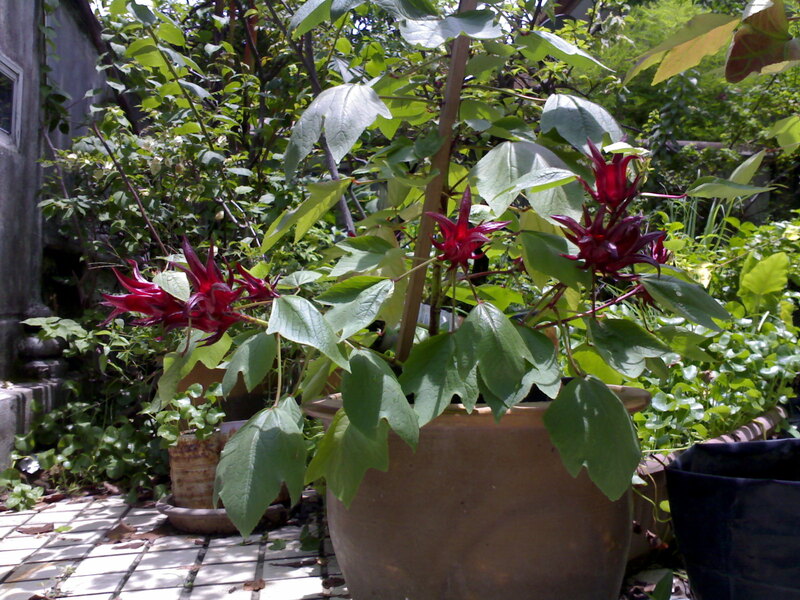 Click here to read about a roselle plant called Rosie. Roselles are cousins of our bunga raya and mulberry. All have their own goodness. Enjoy them for health. Yes, they are. The flowers are the pink ones (see the photo above). it’s good to read your blog because you have such a good command of english. I’m still struggling with my english..hehe. By the way…I know your father (Pak cik Karim). He is my father’s friend. Hi, Jay. I’m glad you like my post 🙂 . If you can get the seed, try planting one in your garden. My brother’s roselle plants took only about 3 months to bear fruit. His plants (in the photos posted on my blog) are only around 4 to 5 months old! Once your plant bear fruits, you can have them just anytime you want and enjoy the benefits of it too. Plant a few plants for more fruits. You do not have to dry the fruit first to make the juice (although you can dry them first if you want to). My mum just pluck and diced them and boil them for an hour or so (suger added to taste). She then let them cool and strain the juice. Try it! 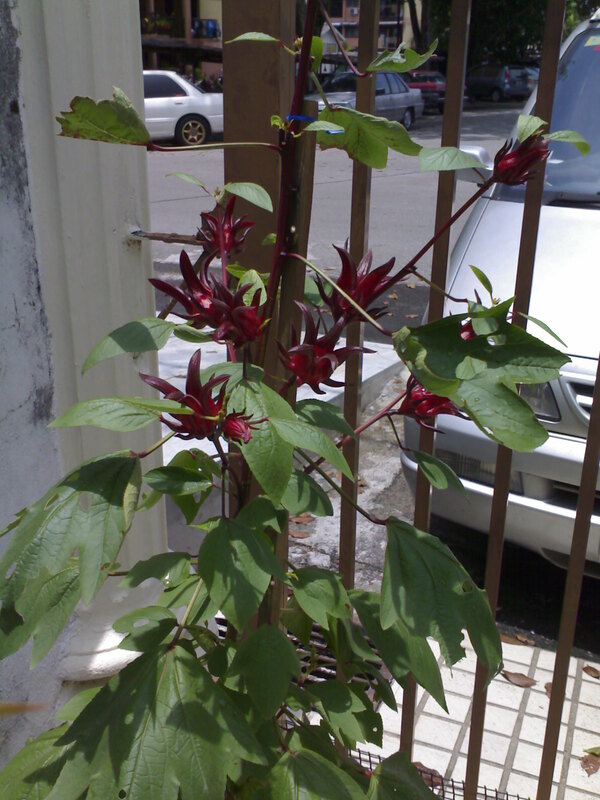 Hi there, can I know where can we buy the roselle seeds to plant? Thank you so much. Where I can find roselle leaves. I living in United State. Any advice. 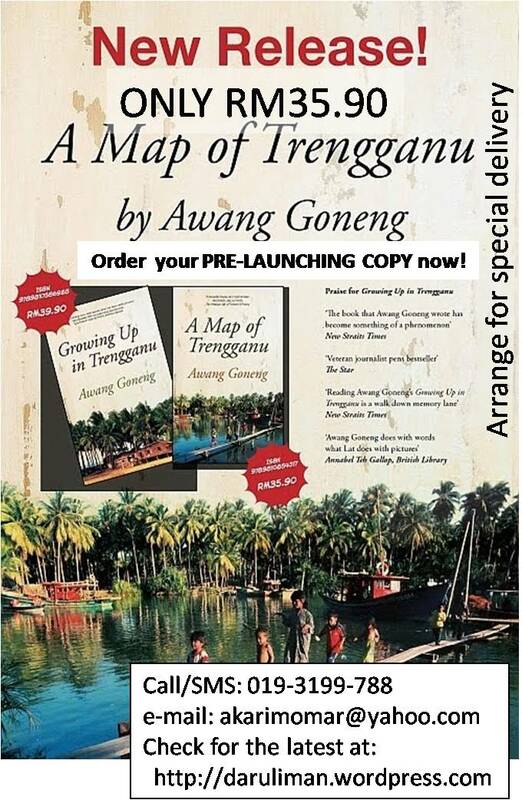 If you were living in Malaysia, I could have sent you some. However since you’re living in the United States, I’m afraid that it is impossible due to the U.S. customs regulations. Very good article on Roselle by you! I absolutely enjoyed all the information since I love eating Roselle very much. Could you please let me know how I could get the Roselle seeds as I’m very interested in growing them. The ones I eat now are all preserved and I don’t think that’s very healthy. HI All Roselle lover, read some articles on Roselle and would like to grow some and test out it’s benefits especially Roselle tea. Was wonder if anyone here can spare me some seeds. I’m from Sabah. Kindly email me and I’ll email my address. Thank you in advance. My friend sent me some seeds from her plant in Hawaii, but I’m not sure if they are roselles or not. Can’t find images of the seed pods on the Internet . Can you identify by a picture? Denise – The seed pods are similar to those of other mallow plants, so I couldn’t guarantee that they were H. sabdariffa from looking just at the pods, but I could tell you if they are consistent with those this species produces, or if they look different. Nice Roselle plant!!!. Do you know where can get Roselle seeds? Thanks! Hi i m a final year student i will need this plant for my research, by ny chance can u pls send the details where n how to purchase. Hi! I really apologise but I don’t sell them myself. However you may be able to find someone who do have them on the internet on websites like MyFolia. Hi Aimna, Can you advise where I can rosella seeds in KL? I’m sorry but I’m afraid even I cannot find the seeds anymore. I used to get them from a relative whose plant had died (and so had ours).